It may be feeling cosy and almost Christmassy indoors but our garden is blissfully unaware that we’re speeding towards the shortest day of the year. It’s been gloomy of late; we’ve had very strong winds and rain (but nothing like the devastating rains in other parts of the country) and not much sunshine. 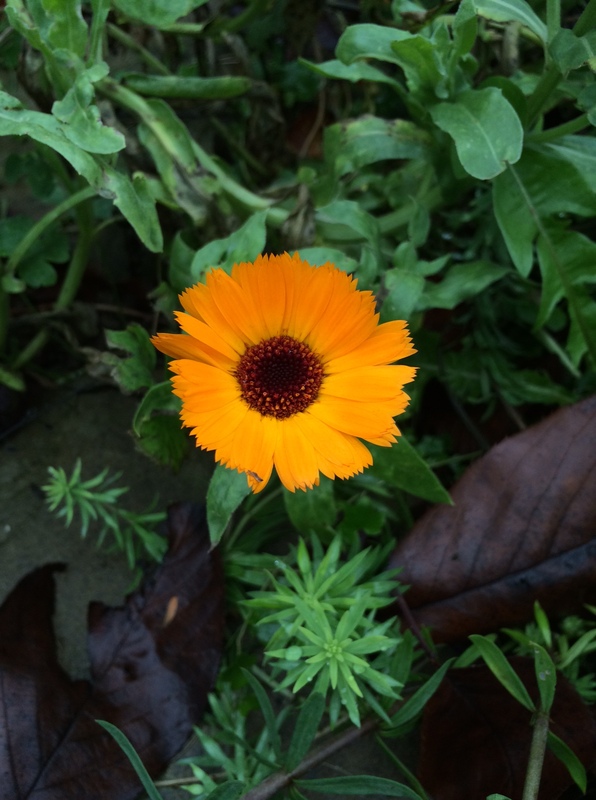 It has been unseasonably mild, though, and this is probably why some plants seem a bit confused. 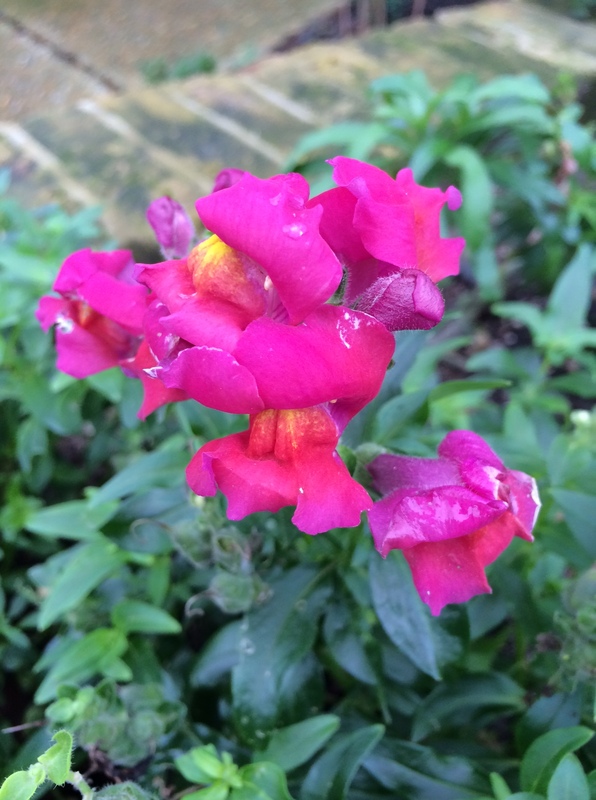 There are still snapdragons. They’re a bit windswept but they’re hanging in there. 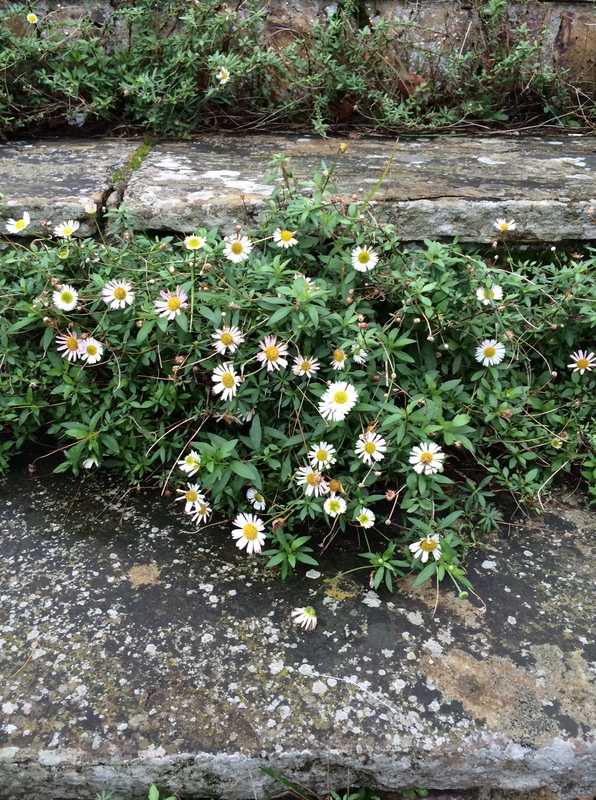 Erigeron karvinskianus is still flowering on the front steps – continuous flowering since April. It’s such a hard-working, undemanding lovely plant. 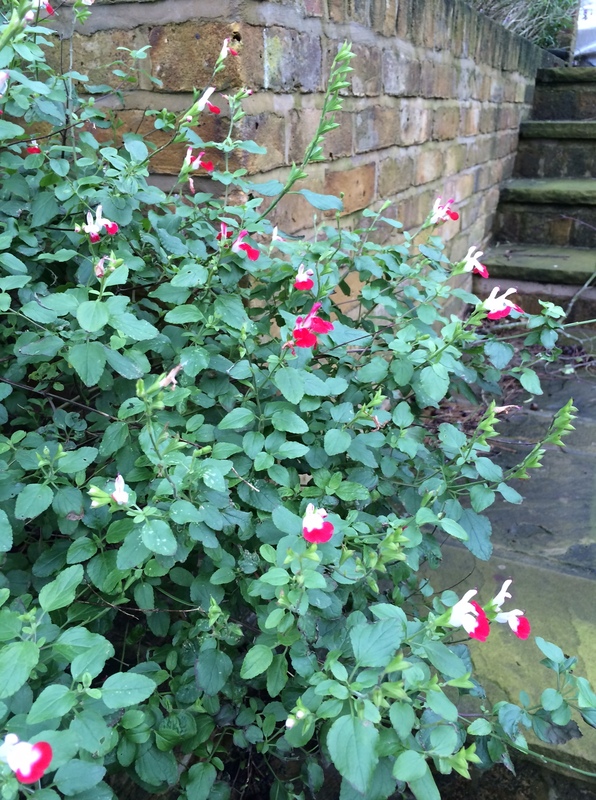 Salvia ‘Hot Lips’ is still going strong. 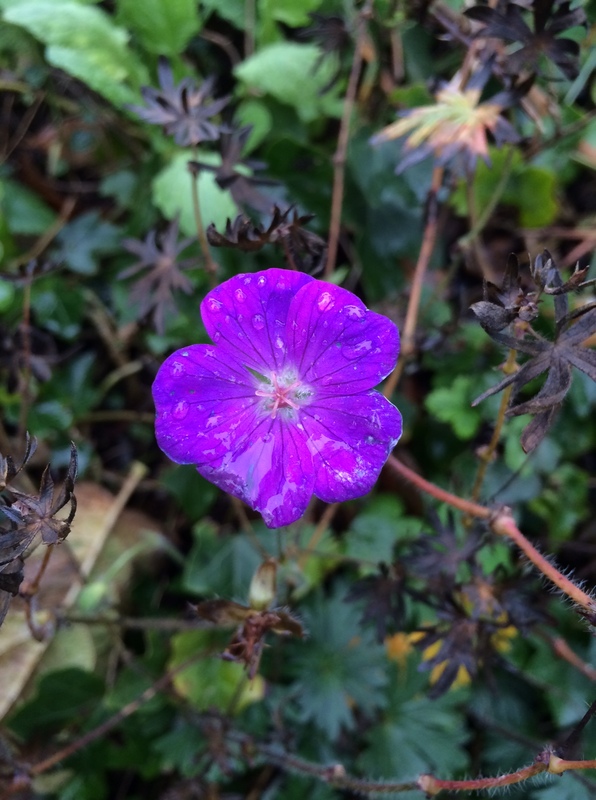 Some hardy geraniums are still sending out flowers and the leaves on others are only just starting to fade. 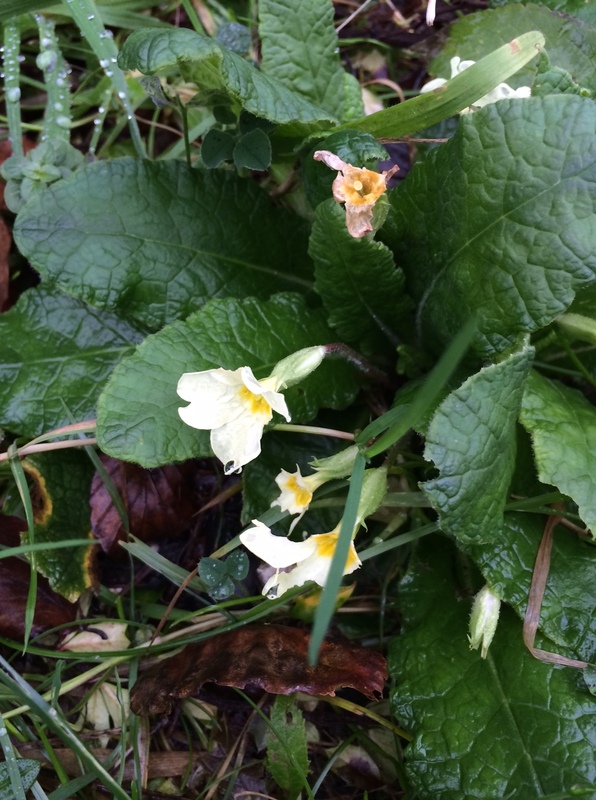 Primroses! This one has been munched by an opportunist mollusc..
And, yes, the cheery geraniums are STILL flowering. This time last year, they were tucked up in the greenhouse. In other news, I took the dog for a short walk this morning – a gentle stroll (no stomping yet) up to the top of the cliffs to breathe in some fresh, sea air and blow the cobwebs away. It was windy and drizzly and grey but it was marvellous. Have a lovely weekend. 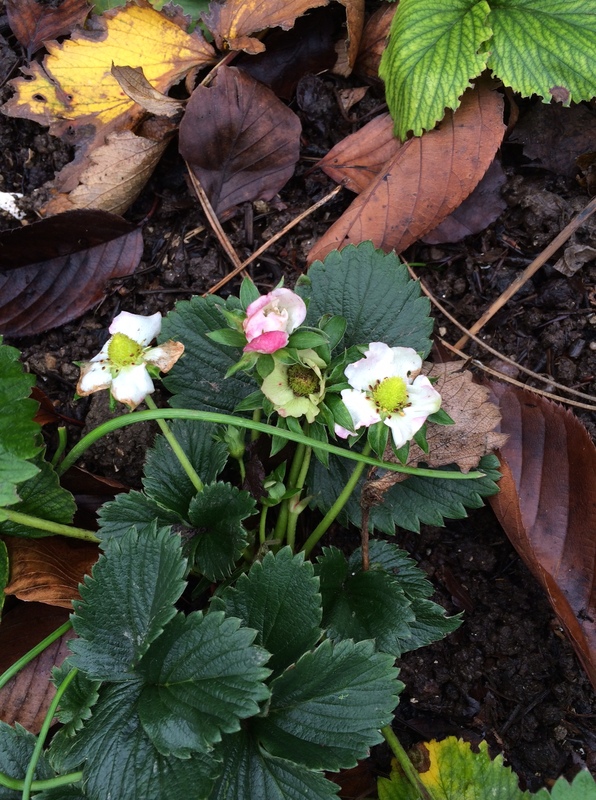 You have a crazy strawberry plant. Mind you I still have raspberries, very wet raspberries. We have soggy raspberries too – bonkers. 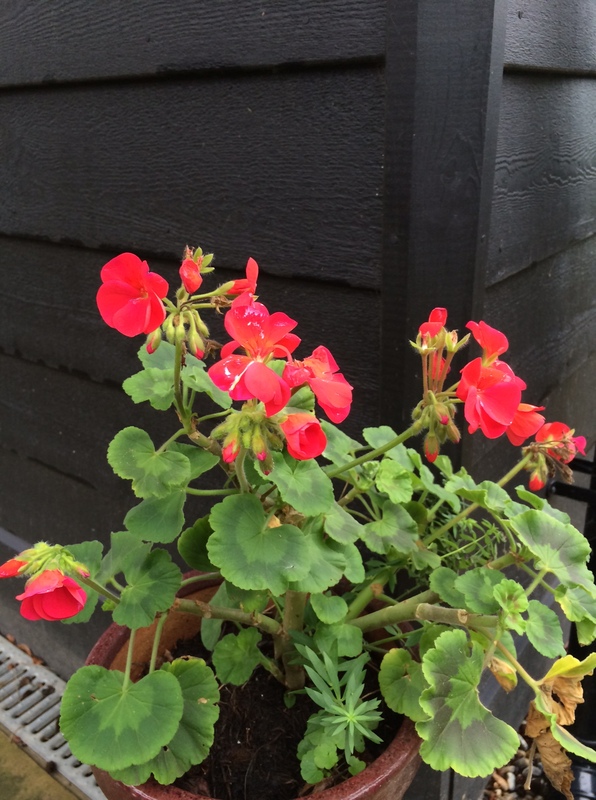 I love that red pelargonium against your black shed, very striking. It’s weird out there. I’ve got all sorts hanging on that really should be resting and lots flowering much earlier than usual. Glad to hear your toe is being gently eased into full stomping mode. Have a lovely weekend – it’s going to be a busy one! It’s all very confusing. I’m hoping we do get a frost this year at least. It is lovely but strange, as you say. We’re having crazy weather over here in Maine, too. We were in shirtsleeves yesterday when we cut our Christmas tree. So happy to hear you are out walking again. It must feel splendid. Just thinking the same here; cowslips have flowered and gone to seed already! Things are flowering here that shouldn’t be out for a month or more yet. So pleased you got out for a walk- onwards and upwards, eh? Yes, lots of plants are disoriented as to time. Maybe you’ll be able to make strawberry pie or jam in January. Oh that would be too weird! You too, CJ. I can’t recommend Erigeron highly enough – it’s such a gorgeous unassuming plant. Daffodils are not something you expect to see this side of Christmas!